Improving gender equity in itself may be a goal with clear, intrinsic value. However, a substantial body of research now suggests that gender equity and the achievement of other development goals, such as health, education, social and economic rights fulfillment, and even growth, are inseparable. For example, higher levels of female education and literacy have been found to reducechild mortality and improve educational outcomes for the next generation. The presence of women in political leadership positions appears to increase schooling for girls. Children’s health is influenced by women’s bargaining power in the home. Lower fertility rates, also associated with increased educational attainment for women, can have a positive effect on growth, while gender inequality in education undermines growth. The UN Development Programme (UNDP) finds a broad correlation between gender inequality and human development outcomes, with low-ranking countries on the Human Development Index (HDI) in general performing much more poorly on gender inequality measurements than high-HDI countries. In my own recent research (as well as a book forthcoming from Oxford University Press this winter), my colleagues and I find a strong correlation between gender equality and economic and social rights fulfillment. Graph 1 illustrates the relationship between ourSocial & Economic Fulfillment Rights Index (SERF) and Social Watch’s Gender Equity Index (GEI) for a sample of 93 countries. 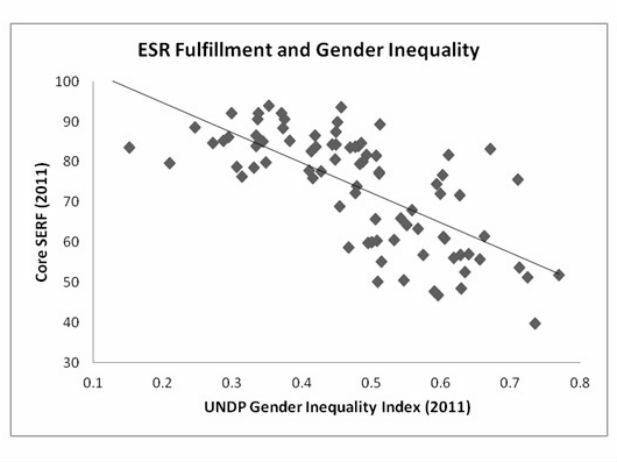 Graph 2 illustrates the relationship between the SERF Index and the UNDP Gender Inequality Index (GII) for 84 countries. The correlation between gender equity and social and economic rights fulfillment can also be observed on the regional level, with the notable exception of the Middle East and North Africa, where social and economic rights fulfillment is relatively high but gender equality is low. There is also a sizable gap in South Asia. Taken together, however, the evidence suggests that increasing social and economic opportunities and political representation for women has ripple effects on health, education, and socio-economic outcomes throughout society and for the next generation. Gender equity and social and economic rights fulfillment go hand-in-hand.